A team of experts is developing a new strategy for protecting and restoring water quality in Puget Sound streams. 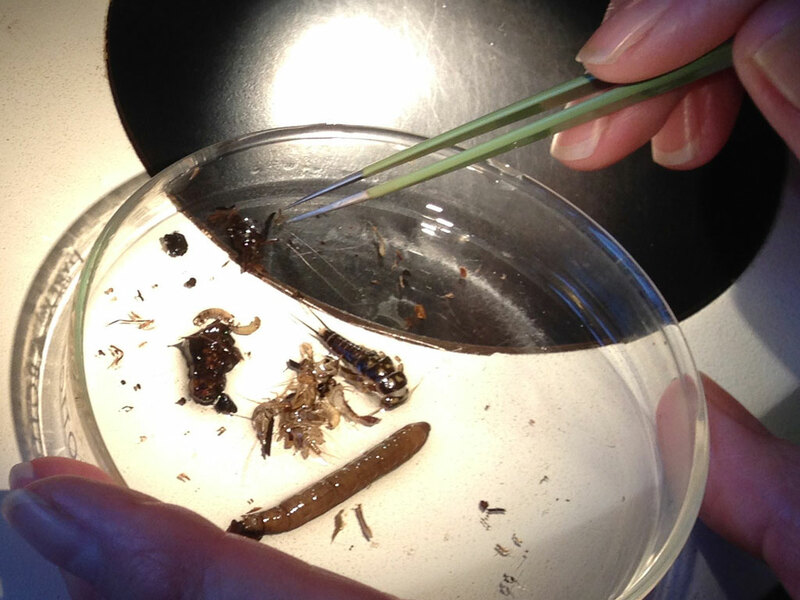 A stream's health can be measured by the health of its mud-dwelling (benthic) invertebrates. Scientists are using a series of measurement guidelines known as the Benthic Index of Biotic Integrity, or B-IBI. B-IBI was chosen by the Puget Sound Partnership as an indicator of freshwater quality, which is one of 25 Vital Signs of Puget Sound health. The measurement is being used to gauge the health of more than 400 separate streams in the Puget Sound region. 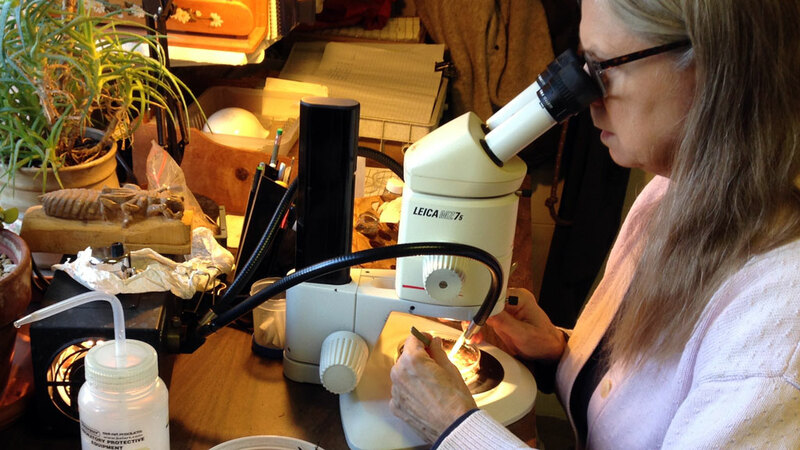 Gripping a pair of sharp tweezers in each hand and peering into a microscope, taxonomist Mindy Allen pushed around some wet sediment in a glass Petri dish. With quick movements, her sharp instruments shredded a small piece of leaf. “I need to pull this leaf apart and look on both sides and all around it,” said Allen, quite at home in this microscopic world where a leaf becomes a sizable obstacle. Her job is to identify tiny creatures including dead snails, worms and insect larvae collected from the bottom of flowing streams and sent to her home-based lab in Shelton. Known as benthic invertebrates, these small animals can tell Allen whether a stream is generally healthy or sick by the organisms she finds in a given sample. The technique is being used to gauge the health of more than 400 separate streams in the Puget Sound region. “Here’s a clam shell; oh, two little clam shells,” said Allen, an independent taxonomist hired by various cities and counties to make these i.d.'s. What appeared to be grains of salt to the naked eye loomed as large spiral shells under the binocular microscope, which provided a three-dimensional view. These white shells once housed a living mollusk in Gamble Creek, a small stream on the Kitsap Peninsula. A measure of stream health, called the Benthic Index of Biotic Integrity or B-IBI, allows each stream or stream segment to be assigned a score, based on the type and number of various benthic invertebrates found in a sample, Allen said. High-scoring streams tend to have a large variety of “bugs,” as researchers often call them, lumping together the benthic species. Extra points are given for species that cannot survive without clean, cool water. On the other hand, low-scoring streams are generally dominated by a few species able to survive under the worst conditions. Like salmon, benthic invertebrates have evolved over thousands of years in the cold, clear-running streams of the Pacific Northwest, said Leska Fore, a monitoring analyst with the Puget Sound Partnership. The best conditions for stream bugs also tend to be very good for salmon. It’s no coincidence that many of these fat little insect larvae are the primary food supply for young salmon, Fore said. Salmon later return the favor when they die, becoming food for a variety of bugs in the stream. “In a healthy stream, a typical sample will have 50 or more unique species (of invertebrates),” Fore said, noting that invertebrate samples are captured in a net after field researchers dislodge an 8-by-8-foot section of streambed. As an indicator of stream health, stream invertebrates can hint at specific water-quality problems, but they rarely provide simple answers about what is affecting a stream, Fore said. Urbanization often means excess stormwater, which picks up pollutants as it flows down impervious surfaces like roads, roofs and parking lots. It also brings high flows and fine sediments to nearby streams — each with its own effects on various stream bugs. Urbanization also can result in loss of vegetation, reducing organic matter vital to certain organisms. Less shade generally triggers higher stream temperatures. In total, urbanization can kill off a multitude of benthic invertebrates, leaving behind limited clues about which of the problems are the most harmful to the health of the stream. Biological indexes have gained wide acceptance from stream ecologists able to interpret what the bugs are telling them. But these new stream ratings probably won’t replace traditional physical and chemical measurements, such as flow, temperature, acidity, dissolved oxygen and concentrations of chemicals and bacteria, all of which affect the entire food web. The physical-chemical measurements remain foundational elements in deciding if a stream is “impaired” under the Clean Water Act. When state water-quality standards are exceeded, the stream is subject to a cleanup plan designed to bring the stream back into compliance with the legal standards. Physical-chemical data collected from streams are incorporated into Ecology’s Water Quality Index, a more direct indicator of freshwater problems than B-IBI. The two indexes go hand-in-hand, according to Chad Larson, who heads biological monitoring for Ecology. The trouble with physical-chemical data is that they represent only a snapshot of conditions at the time of measurement — except in rare instances where biologists have installed continual-monitoring equipment. Problems that can upset a stream’s biology — such as high streamflows, elevated temperatures and chemical incursions — may go unrecognized with traditional sampling, while the bug community tells a story about what has taken place over the course of their lifetimes. “Ideally, we would have data on them both, the habitat and the chemistry,” Larson said, noting that the latest approach is to integrate all kinds of data into an understanding of what is working well and what may be creating stressful conditions. The classical listing of impaired waters is based on streams that fail numerical water-quality standards for chemistry and other factors. Now Ecology and the Environmental Protection Agency are experimenting with a classification of “biological impairment” based on the composition of stream biota, including B-IBI scores. Squalicum Creek near Bellingham and Soos Creek near Auburn are undergoing intense studies to determine whether biological information can be used to develop a cleanup plan under the Clean Water Act. Both streams have long been known for other problems, and both are listed as impaired for dissolved oxygen, temperature and bacteria. Some stretches of both streams have been found with elevated levels of heavy metals, including mercury. Soon-to-be-released findings from the study could assist those developing the upcoming Implementation Strategy for B-IBI. The goal in this case is to find ways of moving the B-IBI score from “fair” to “good” for 30 streams, while maintaining “excellent” scores for streams meeting the highest standard. B-IBI scores are composed of 10 separate criteria, each of which is ranked from 1 to 10 for a given stream. Criteria include the total number of species collected, intolerant species (the ones that die out first), and long-lived species (which can live more than a year if something doesn’t kill them). Developing a method of finding and fixing the factors that are killing off good bugs is the focus of the upcoming Implementation Strategy for raising B-IBI scores. Eventually, 30 streams must be identified for improvement. 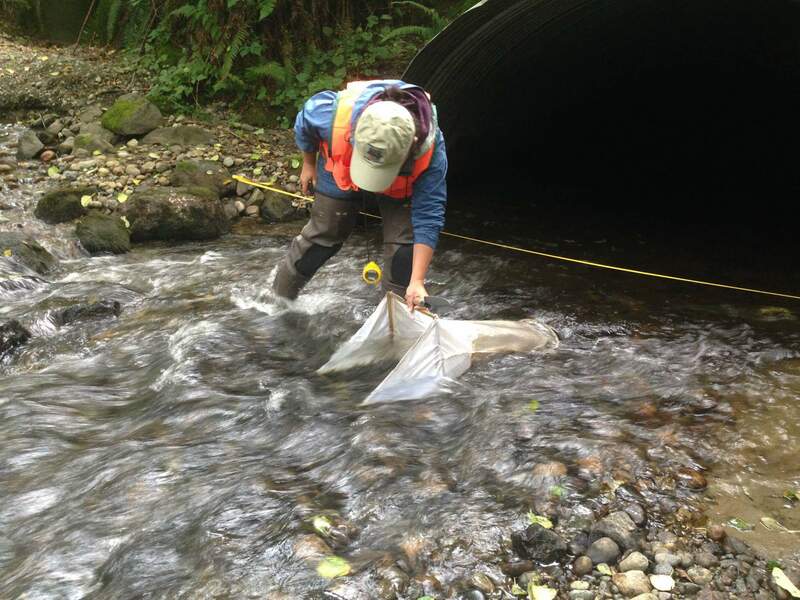 “We don’t have a final list of 30 streams, but we have a list of 54 that we worked through using various (screening) layers,” said Kate Macneale, a King County environmental scientist who helped study particular streams under an EPA grant. The report, “Strategies for Protecting and Restoring Puget Sound B-IBI Basins,” is considered a first step in the development of an Implementation Strategy for freshwater quality. In choosing streams for future restoration projects, one factor to consider is support from the nearby community, Macneale said. In some cases, one or more species of stream invertebrates may fail to recover even when adverse conditions no longer exist, according to Fore of the Puget Sound Partnership. That may occur, for example, when pesticides kill off beneficial insects in an isolated area, making recolonization slow or impossible. The team developing the B-IBI Implementation Strategy began meeting for the first time in late 2016. Recognizing that every stream is different, team members hope that lessons learned from one stream can be applied to others throughout Puget Sound. Under the Benthic Index of Biotic Integrity, or B-IBI, the health of a stream is judged not only by what is there but also by what is missing. When conditions are less than ideal, the composition of the benthic community begins to unravel. The missing pieces may provide clues about specific problems affecting a stream. Elevated stream temperatures, for example, will reduce the populations of invertebrates sensitive to temperature; low oxygen will affect another group, organic pollution another, and so on. Stoneflies are often the first to disappear when a stream is disturbed by human activities. Like their name implies, stoneflies like to hide among little rocks. Fine sediment can fill in the spaces of a stonefly’s gravelly habitat, causing them to die or move elsewhere. Stoneflies also are more likely than most to succumb to conditions of low oxygen or warm water. Many types of mayflies graze on algae, which can be killed by heavy metal pollution, so mayflies tend to disappear in streams impacted by mining —even if the stream is otherwise pristine. Unlike mayflies, certain kinds of caddisflies and stoneflies may survive in isolated areas where mine tailings are the only source of pollution. Some caddisflies construct and occupy elaborate little houses made of bits of wood, sand or broken shells, giving the young insect a tight enclosure to protect them from predators. 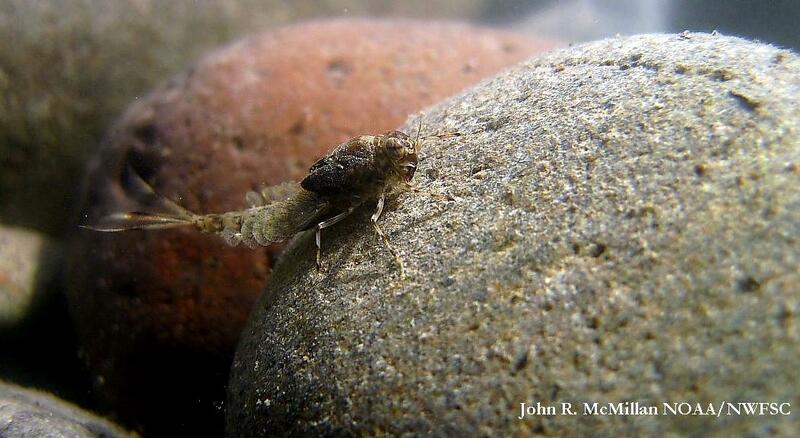 Caddisflies that don’t live within cases are typically predators that eat other invertebrates. A significant number of insect predators looming about is another sign of a healthy stream, because predators feed on an array of smaller animals in the stream. Leska Fore of the Puget Sound Partnership said it is important to recognize that closely related species don’t always respond the same way, which is why experts have grouped the bugs by their behavioral characteristics. “Clingers,” for example, are those that hold tightly to rocks in swift currents. Clingers don’t do well in fine sediment. “One type of mayfly shows up in really high proportions at disturbed sites,” Fore said, noting that Baetis tricaudatus — the blue-winged olive — seems to make an appearance where other mayflies disappear. Some insects, such as black flies, are tolerant of even the worst conditions, dragging down the B-IBI score for any stream where they are found in high abundance. The Fine Sediment Sensitive Index focuses on species that can’t survive in silty streams, so their absence suggests a sediment problem. The Metals Tolerance Index looks at species that do better than others in the presence of heavy metals, so their presence indicates pollution with metals. The Hilsenhoff Biotic Tolerance Index looks for rare species able to survive organic chemicals. The Benthic Index of Biotic Integrity, B-IBI, produces a score for a given stream by considering 10 characteristics of bottom-dwelling organisms. For each characteristic, a formula produces a result ranging from 1 to 10. When added together, the final B-IBI score for any stream ranges from 10 to 100. Total taxa richness: This is a count of all the benthic invertebrate species found in a stream sample — mayflies, caddisflies, stoneflies, true flies, midges, clams, snails, and worms — a measure of biodiversity. The number generally declines following changes in flow, alterations in natural habitat or the introduction of harmful chemicals. Mayfly taxa richness: The number of mayfly species declines in response to most types of human disturbance. Many mayflies graze on algae, so they will disappear when pollution, such as heavy metals, destroys their food supply. Livestock waste and fertilizers can increase the number of mayflies. Stonefly taxa richness: The number of stonefly species often declines at the first sign of human disturbance. Some stoneflies are predators that hide around and between rocks while hunting for prey. Others are “shredders,” eating leaves that fall from nearby trees. Fine sediment can fill in the spaces among the gravel, causing stoneflies to die or move on. They also require cool water and plenty of oxygen to do well. Caddisfly taxa richness: The number of caddisfly species declines as disturbance reduces the variety and complexity of stream habitat. Species are quite varied, some spinning nets to trap food, some collecting food from exposed rocks. Many build cases of sand or bits of wood to protect themselves from predators, and some are predators themselves. Intolerant taxa richness: The number of species identified as being sensitive to disturbance is a powerful indicator of stream health. They are usually the first to disappear when a stream is altered. Clinger taxa richness: Clingers have physical characteristics — suckers, claws or body shapes — that help them hold onto smooth gravel in rapidly flowing streams. They use spaces among gravel for feeding, escaping predators or laying eggs, so the number of species declines as fine sediment fills in the spaces and reduces complexity of the streambed. Long-lived taxa richness: A count of species that live more than a year in a stream provides evidence of stream health over longer time periods — from high flows in winter to low flows in summer. A small number of long-lived species may suggest intermittent problems in a stream. 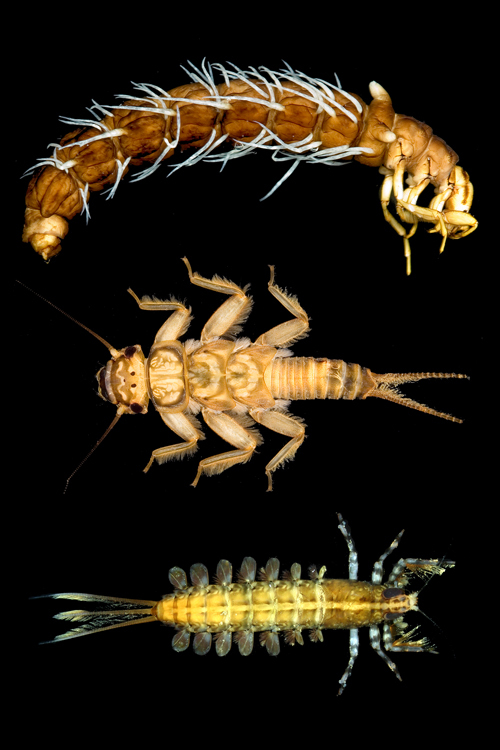 Percent predator: Species listed as predators depend on other invertebrates for food. When their numbers are high, lower levels of the food web are relatively intact, while a low percentage suggests an altered stream. Predators often have large eyes and/or long limbs for spotting and catching prey. Percent tolerant: Tolerant species are those identified as being able to withstand alterations in natural stream conditions. A high percentage of tolerant species is evidence of human disturbance. Percent dominant: Certain groups of invertebrates tend to take over as a stream becomes disturbed. This category counts the number of individuals in the three most common groups found in a sample as a percentage of the total number of individuals in the sample. A high percentage means that biodiversity in the stream is limited. Note: High counts for most categories result in higher B-IBI scores. The exceptions are “tolerant” and “dominant” categories, for which the formula produces a low result for high percentages of tolerant and dominant species. In addition, final numbers within each category are adjusted up or down to keep them within a range from 0 to 10.